where did you get the tile base board trim? what color is the saltilo tile floor? looks like malay tan (behr) or antique birch (benjamin moore)...? 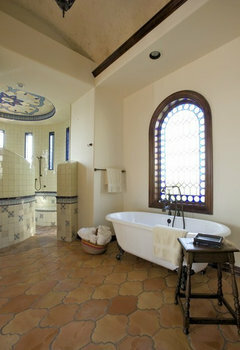 Hi Theresa, the color of the floor is a the natural Saltillo Tile in what we call our "Traditional" finish. We offer wholesale affordable pricing on all Saltillo tiles and global shipping. www.saltillotileconnection.com. What is the type of wood and color of the stain on the doors? What is the name and brand of paint color? What is the paint color of these walls please? Floor tiles - Where can I get the tiles .... color make size grout? Looks like "Super Saltillo" which has slightly rounded edges and is a little more durable than regular Saltillo. You can get it at many, many tile & big box stores. Use gray grout for a traditional look. Grout lines have to be wide to accommodate the slightly irregular tiles. Saltillo has to be installed by an experienced tile person, and sealed regularly. It's soft and will scrape pretty easily - I had it in a previous house. Nothing beats the look, but be prepared for the care it requires. I must agree with rgladstein! This does look like Super Saltillo. We did not provide this tile but we do carry it and are able to ship it anywhere! If you are looking for samples in order to see if they are appropriate for your home let us know! We typically recommend the Natural Gray Saltillo grout. Also, it is a great idea to have an experienced installer to install the floor! What is the size of the bullnose? Looks great! Doors are 3/4" aluminum and corners of walls are 1-1/2" aluminum. Hi. Can you tell me please how wide this hallway is? Thanks! Hi hope you are doing well and this helps. 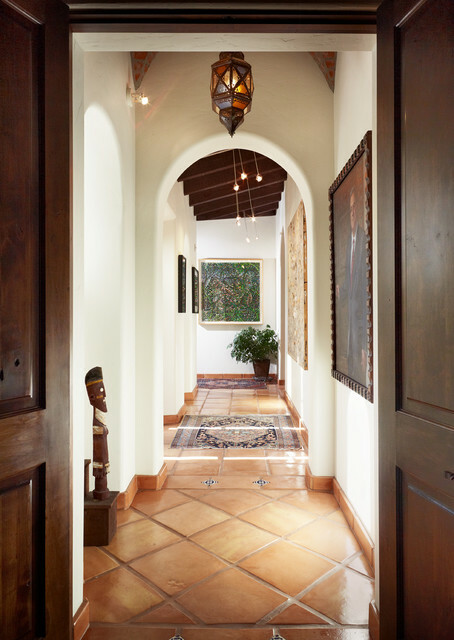 the hallway length is 25'-6"
width at the arch is 4'-0"
width at doors and windows is 6'-0"
What is the actual grout color? - I am using a super Saltillo that has been stained and glazed and don't like the way it looks with the traditional natural gray. I am thinking about using nutmeg for grout but want to make sure it won't look too "red". Thank you in advance for your answer. I would like to know as well. Thanks! Nice grout joint, but when dirty, what do you use to clean it? where can i find the light fixture?